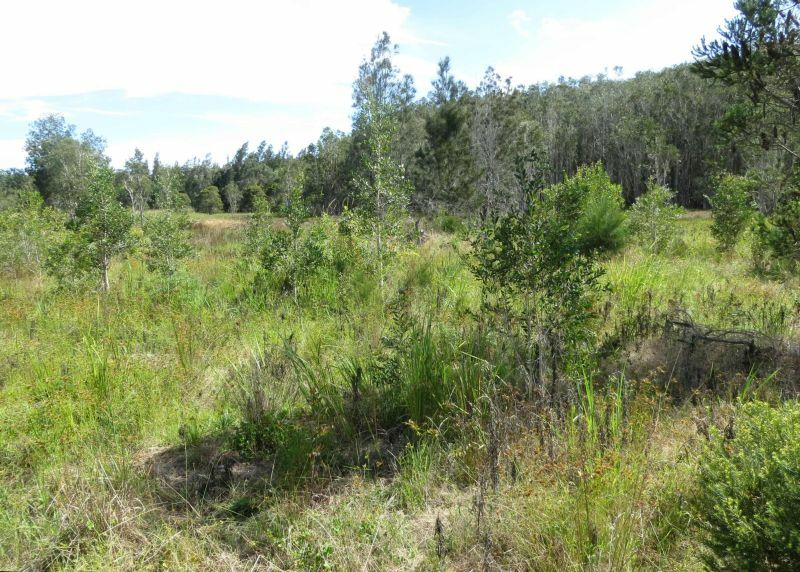 Contract bush regeneration works involving fire and weed management commenced in 2011 in 2.5 ha of endangered ecological coastal floodplain communities at the Cowards’ property on the Gap Road, Woodburn in northern NSW (Fig 1). An area of 7.19 ha of the 10ha property had been recently covenanted for conservation by new owners and 2 small grants were gained to convert the previous grazing property back to forested wetland. Remnant vegetation existed on the property and regrowth was already occurring, although extensive areas were dominated by exotic pasture grasses, particularly >1m high swathes of Setaria (Setaria sphacelata). Works commenced with spraying of the weed with herbicide and regular follow up spot spraying of weed regrowth. However, because the dead Setaria thatch was taking a long time to break down (and high weed regeneration was likely) a burn was carried out to hasten the recovery responses to fit within the 3 year funding cycle. The works were monitored before and at 6 monthly intervals using 6 (9m2) quadrats in each of hot burn, cool burn and unburnt areas (Fig 1). Figure 1. Works zones at the Gap Road wetland – mapped in April 2013 where the quadrats were laid out. and data recorded prior to and at 6-monthly intervals after treatment. Works undertaken. 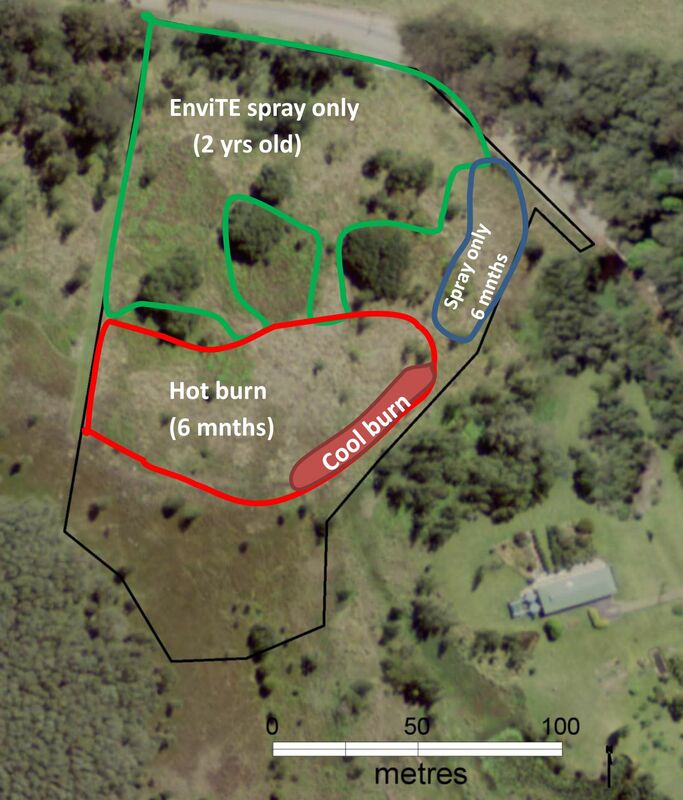 A 2-3m wide firebreak was cut around the burn area and a burn was conducted in dry conditions on Oct 19th 2012 (Fig 2) by the landholders, assisted by Minyumai Green Team and with the local fire brigade on standby. The fire burnt approximately 0.5 ha of the Setaria-dominated area, most of which had been previously sprayed (Fig 2). Results. A more complete (and presumably hotter) burn was achieved in the sprayed areas (Figs 3 and 4). Setaria and Ragweed germinated prolifically, with a few natives and the site was virtually blanket sprayed with glylphosate. By the second follow up natives had started to regenerate so spot-spraying was used thereafter, taking care to protect the natives. Within 5 months quadrats in the sites that burned hotter achieved over 50% native cover, while the unburnt area achieved only half (25%) that cover. Both areas ultimately achieved similar recovery of natives, but markedly higher spot spraying inputs over longer time frames were needed in the unburnt areas compared to the hotter burn areas. Over the three year contract, unexpectedly high and prolific regeneration occurred of 35 species of native forbs, sedges and grasses (germinating from buried seed banks) and 7 species trees and shrubs (largely from seed rain) (Fig 5). However, weed germination was also prolific, particularly in unburnt areas, and required at least monthly levels of continual suppression. Figure 3. Sprayed Setaria prior to the burn. Figure 3. Prolific native groundcover and tree regeneration 2 years after the burn and as a result of consistent spot spraying. Lessons learned. 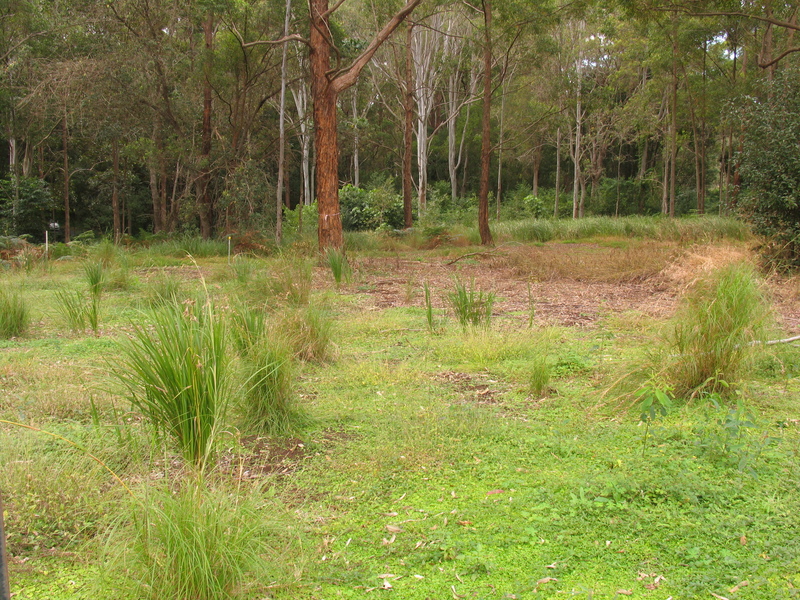 The proximity of remnant vegetation (within 100m) and intact soil profile was important to the native recovery. At least monthly weed control is essential and can achieve results on its own. However, the project involved substantial volunteer time as well as contract labour – and when labour was insufficient new weed populations formed in the disturbed areas that then required more intensive treatment to overcome. Comparing the demand for weed control in burnt and unburnt areas showed that the feasibility of weed control is very much reduced without the use of fire to flush out weed at the outset. Acknowledgements: The project is dedicated to the memory of Murray Coward who helped initiate the project. Minyumai Green Team (Daniel Gomes, Justin Gomes, Chris Graves and Andrew Johnston) have kept the project on track over the years, with assistance from Tein McDonald. Thanks is due to the EnviTE team, particularly Virginia Seymour, for their work at the site in the first 18 months. The project is covenanted with the Nature Conservation Trust of NSW (NCT) and received some initial funding from NCT. It subsequently gained a $15K Private Land Conservation Grant (funded by Foundation for National Parks and Wildlife and managed through the NCT) and has now gained a second, similar grant to continue and expand the works. Re-introducing burning to Themeda Headland Grassland EEC, Narooma, NSW. Posted on 6 October 2015 by teinm | Comments Off on Re-introducing burning to Themeda Headland Grassland EEC, Narooma, NSW. 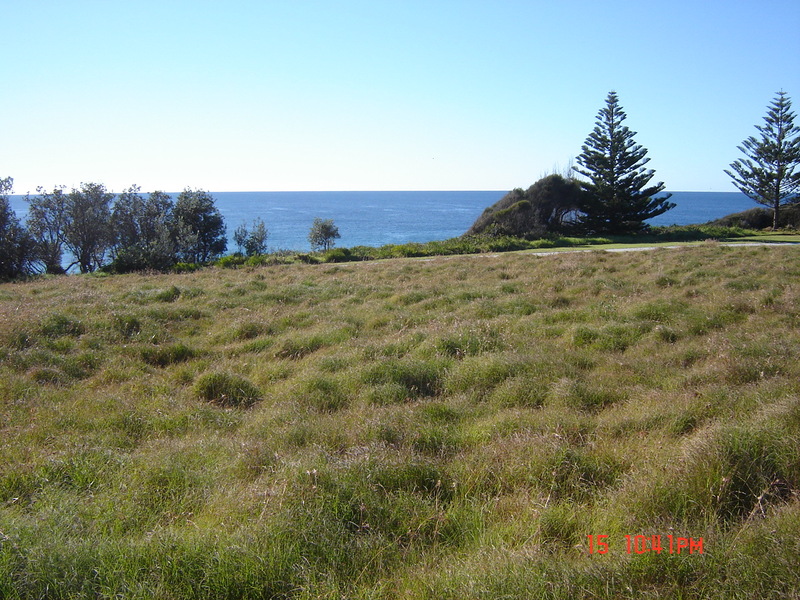 Introduction: In 2012, Eurobodalla Shire Council commenced a project to preserve local stands of declining Themeda Headland Grassland on Council managed land on three small headlands north of Narooma, NSW. Themeda Grassland on Seacliffs and Coastal Headlands is an Endangered Ecological Community (EEC) that grows on higher fertility soils and is listed under the NSW Threatened Species Conservation Act 1995. 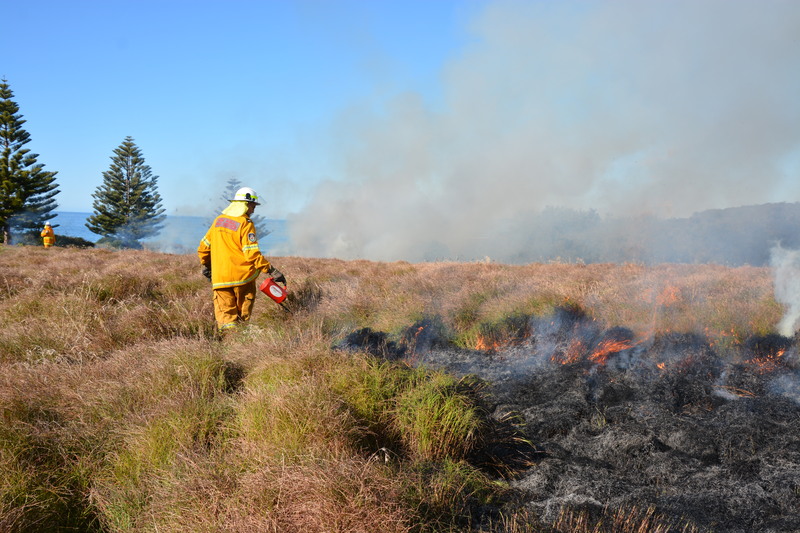 Burning was trialed at two of the three sites to test whether fire could improve the environmental integrity of these sites. This trial has potential implications for the much larger stands of this EEC in various conservation reserves scattered along the NSW coastline as there are many which are not currently actively managed. The three sites were slashed annually until 2010. 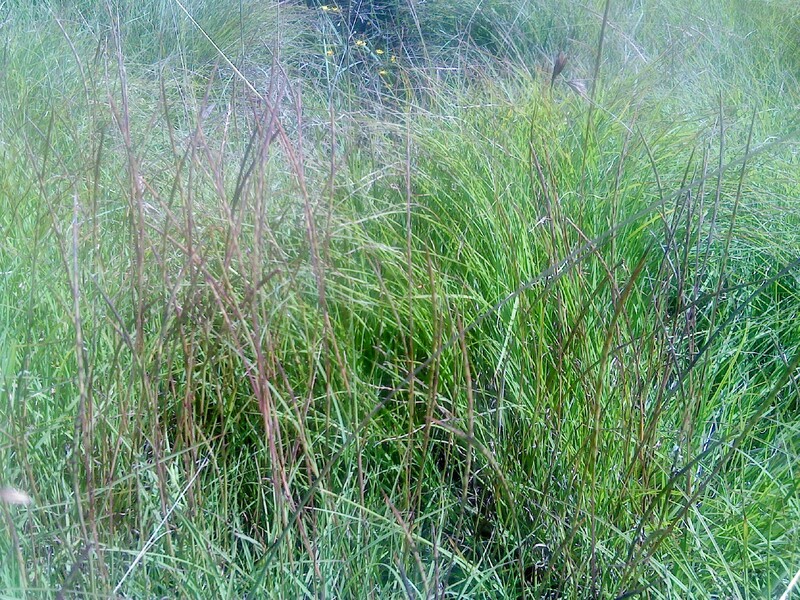 While the dominant grass, Kangaroo Grass (Themeda triandra) was still present on all sites, the sites exhibited some decline in Kangaroo Grass cover and vigour, with weed present on all three sites (Fig 1). Slashing had kept the headlands free from shrubs however windrows of slashed grass suppressed Kangaroo Grass and appeared to encourage weed invasion. One of the sites, which was left unburnt for logistic reasons, was initially in worse condition than the other two due to the presence of an old vehicle track and more extensive weed cover particularly from Kikuyu (Pennisetum clandestinum). The intensity of a burn is likely to vary on a seasonal basis and is dependent on the build-up of dead thatch and the prevailing conditions on the day. There is basis to believe that the traditional aboriginal burning would have taken place in Autumn and would have been a relatively cool burn. The optimum time to burn when considering the constraints of weed invasion is early spring. Works undertaken: Two successive burns were conducted in early spring on 2 of the 3 headlands, in August 2013 and August 2014 (Fig 2). The burn in 2013 was hotter than the burn in 2014 due to a higher build up of Kangaroo Grass thatch prior to the burn. Follow-up weed control was implemented after the burns as the fire created gaps between the grasses and allowed targeted chemical control minimizing off target damage to Kangaroo Grass and other native species. Data were collected on three occasions using ten 1 x 1 m quadrats, established along a 50 m transect spaced at 5 m intervals (one of these for each headland). The initial baseline data were recorded in Nov 2012, prior to the spring burns, and in each successive summer (2013/14 and 2014/15) following the burns. Results to date: The burnt areas (Figs 3 and 4) showed a significant decrease of annual exotic grasses; especially of Quaking Grass (Briza maxima) and Rats Tail Fescue (Vulpia spp.). The burnt areas also showed vigorous Kangaroo Grass growth and moderate seed production of that species. Two native species -Dwarf Milkwort (Polygala japonica) and Matgrass (Hemarthria uncinata Fig 5) not recorded prior to treatment were found after treatment in the quadrats. The most abundant native forbs, Swamp Weed (Selliera radicans) and Indian Pennywort (Centella asiatica) have persisted on the quadrats but not increased (Fig 6). Some exotic forbs – e.g. Yellow Catsear (Hypochaeris radicata) and Scarlet Pimpernel (Anagallis arvensis) have taken advantage of the removal of grass biomass and have also increased, further future analysis will determine whether this increase will impact on the native forbs. Perhaps the most important finding is the Coast Banksia (Banksia integrifolia) seedlings were killed by the fire allowing the sites to remain grassland. 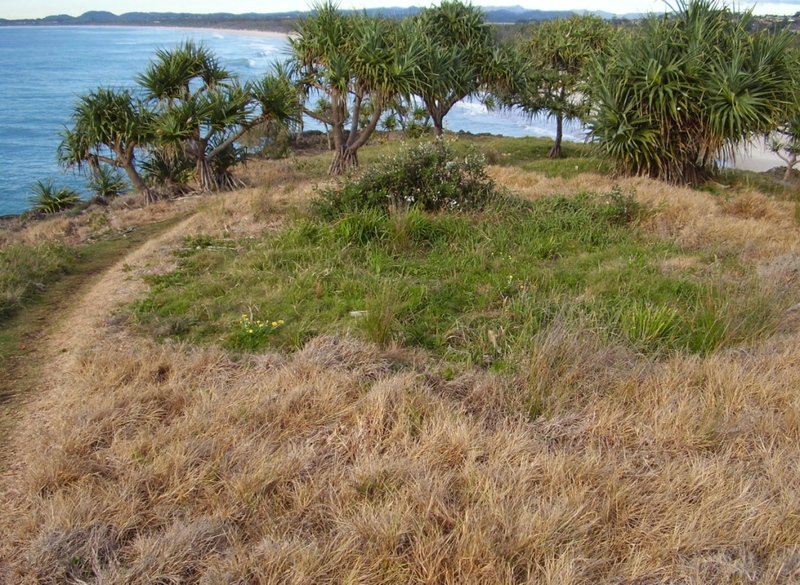 The unburnt headland continues to deteriorate, with ongoing evidence of continued senescense of Kangaroo Grass, no Kangaroo Grass seed production, and exotic plants continuing to replace Kangaroo Grass in parts of the site. Kikuyu is the main exotic species on this site and is responsible for continued suppression of the native components of the grassland. There is also evidence of shrub invasion beginning to occur. It is anticipated that this site will be burnt in spring 2015. 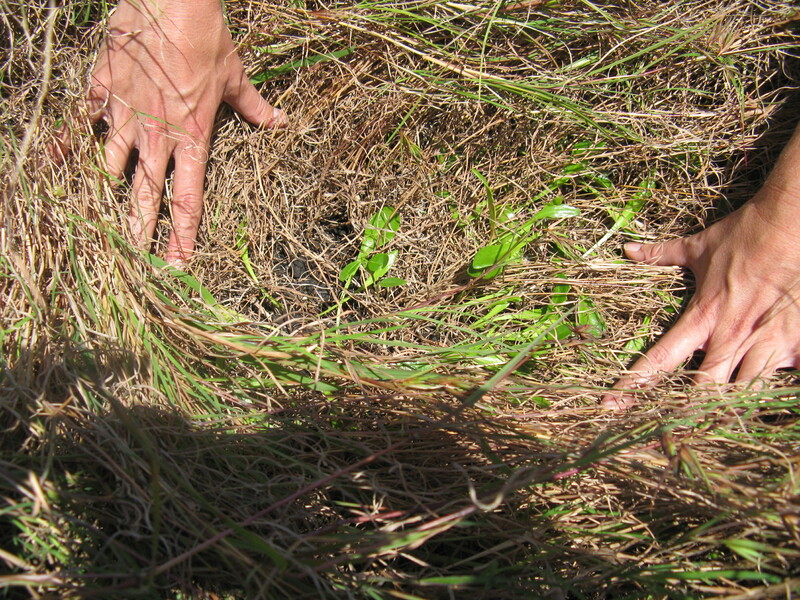 What we learned: Kangaroo Grass remains vigorous throughout the burnt sites. The results to date show annual burning to be generally beneficial to the herbaceous components and associated grasses of this EEC. There was a higher success of exotic annual grass control in the first year which is most likely attributed to a hotter fire and perhaps timing. The first year also had accumulated multiple years of thatch which may have assisted fire intensity. Supplementary chemical control was effective, particularly when the fire created gaps between the grasses, allowing for better targeted chemical control. Future directions: So far the results have shown that an August fire followed by the targeted chemical control of exotic grasses has considerable positive influence on the overall environmental integrity of this ecosystem. The annual burning allows the EEC to remain a grassland by killing off Coast Banksia and Coastal Acacia seedlings. 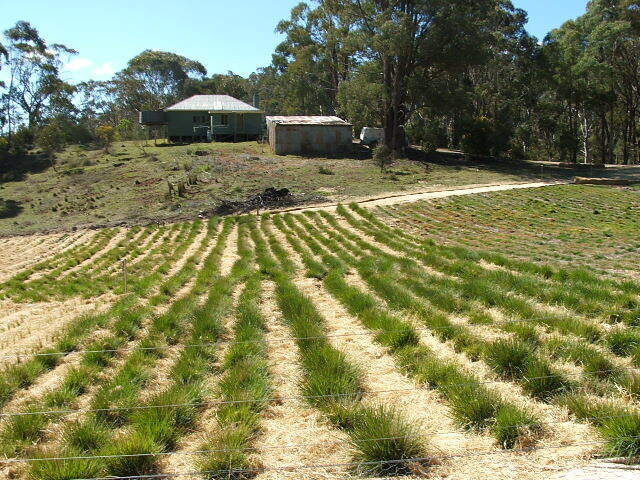 It invigorates Kangaroo Grass growth and reduces the biomass of exotic perennial grasses at least in the short term. This again creates an opportunity in the aforementioned targeted chemical control. The herbaceous composition of the headland also remains intact and future analysis will determine whether burning has either a neutral or positive effect on growth. Kikuyu, Paspalum (Paspalum dilitatum) and annual exotic weeds continue to be the main problem. Increased post-burn selective herbicide application or hand weeding and planting of Kangaroo Grass tubestock may help to restore the grassland more rapidly than use of fire with limited weed control alone. Ongoing funding is being sought to continue the works over coming years and achieve further positive future outcomes. 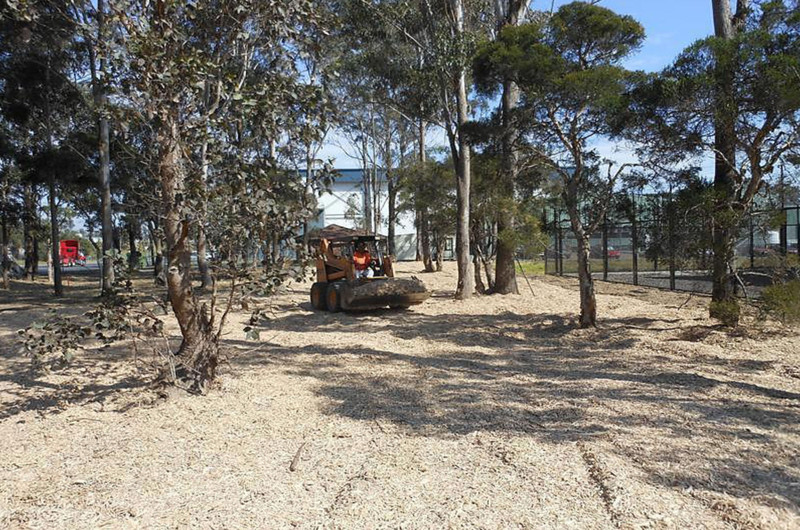 Acknowledgements: The works were undertaken by Eurobodalla Shire Council with funding from the NSW Environmental Trust. Fire assistance from the NSW Rural Fire Service and cultural advice provided by Elders of the Walbunja people. Contact: Tom Dexter; Environment and Sustainability Project Officer; Eurobodalla Shire Council (PO Box 99 Vulcan St Moruya 2537, Australia. Email: tom.dexter@eurocoast.nsw.gov.au). Fig 6. The forb Sellaria radicans persisted among the grass after fire. 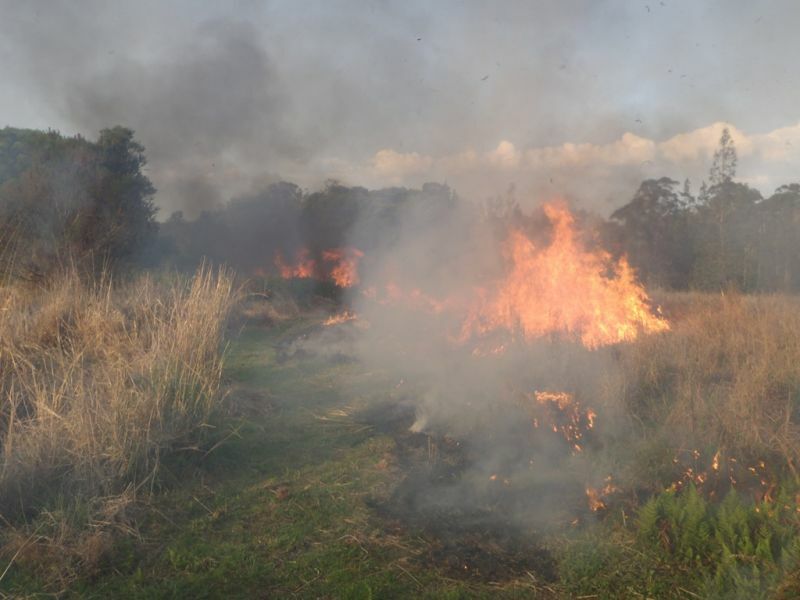 Comments Off on Re-introducing burning to Themeda Headland Grassland EEC, Narooma, NSW. 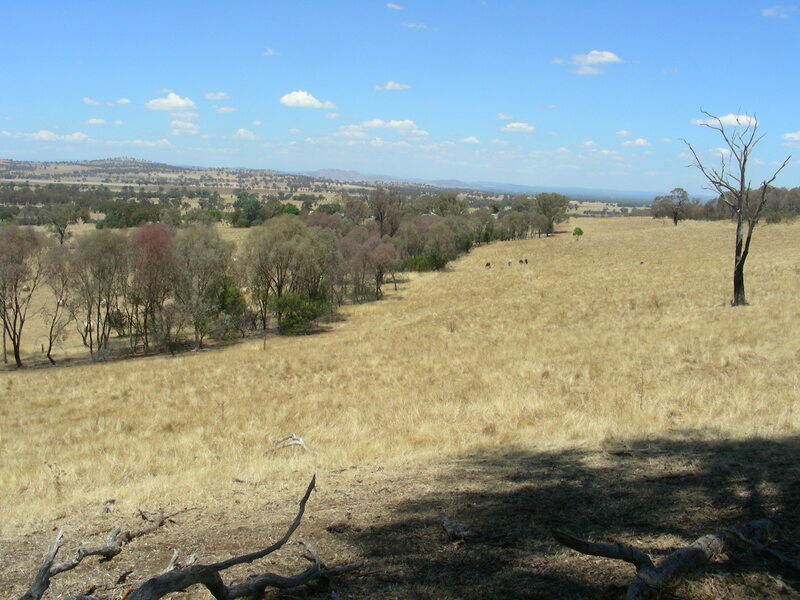 The West Hume Landcare Group was formed in 1989 as a community response to land degradation in the area. Funding to employ a coordinator for three years was obtained in 1990. 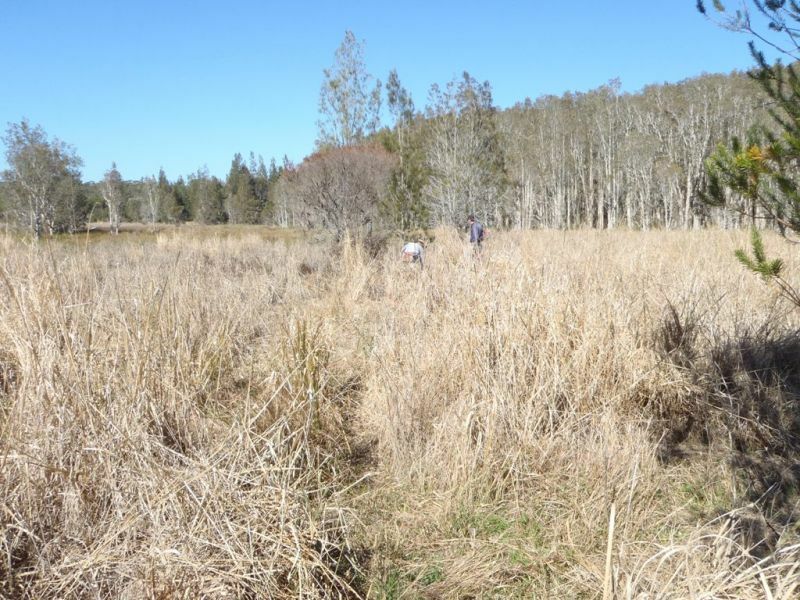 This enabled a high level of project activity in addition to tree planting, including a roadside vegetation survey, farm planning workshops, demonstration sites for ground water recharge and discharge management, and perennial pasture establishment. In the first 5 years of its existence, the group organised nearly 250 different events, attracted funding of over $500,000 and managed 17 different projects. The second 5 years saw a period of consolidation – then, from late 1997, the employment of a full time project officer enabled the development of a Land and Water Management Plan. By early 2000 the Group had attracted a total of $1,000,000 in project funding over 11 years. “Taking Charge of Recharge” was the largest project undertaken by the West Hume Landcare Group, commencing in 2001. It involved 80 properties, with a total of 170,009 local trees and shrubs planted on 370 ha. Some 93 ha of remnant vegetation were fenced over the two years of the project. 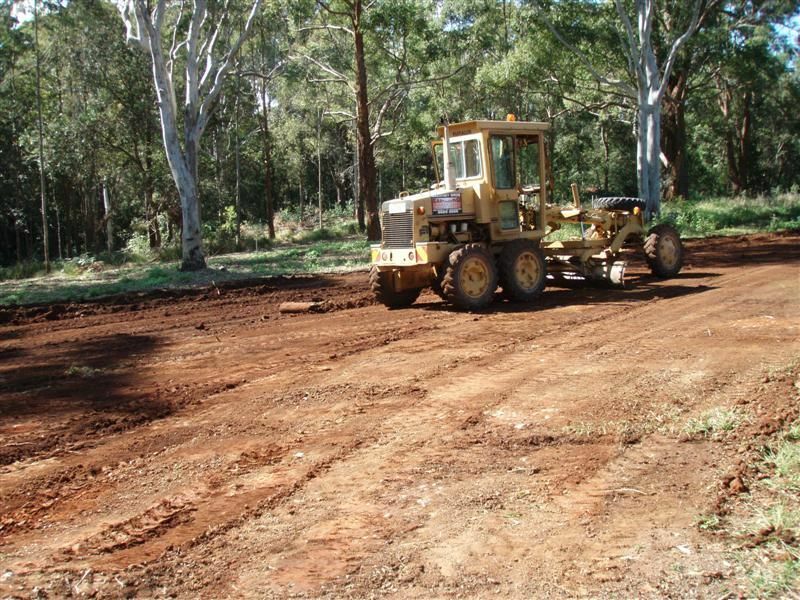 This project was the climax of a very busy 12 years of the Landcare Group’s life, during which 400,000 trees and shrubs were planted in a wide variety of projects across the landcare area – in addition to direct seeding and natural regeneration. This revegetation had a variety of purposes, including recharge and discharge management, corridor linkages between remnants, vegetation connections specifically designed to strengthen the local (threatened) Squirrel Glider (Petaurus norfolcensis) population, and livestock shelter. Many of the planting projects initially involved only small numbers of trees, with a low proportion of shrubs. 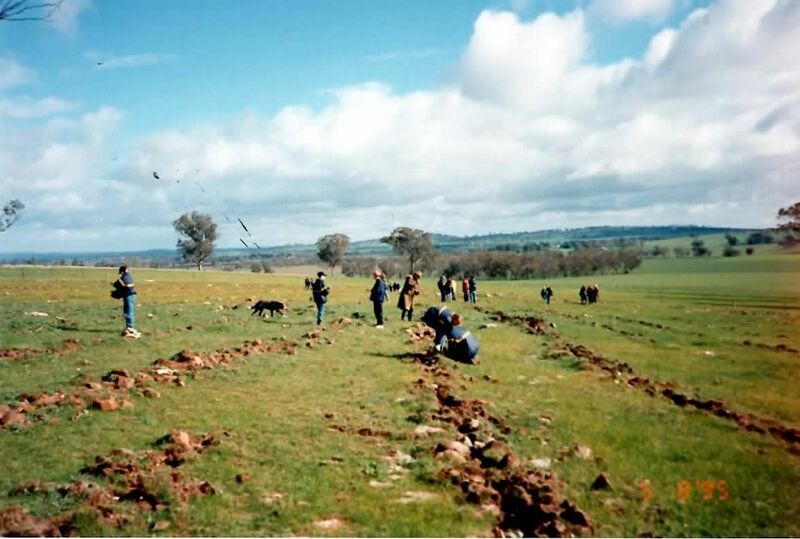 They were important in giving landholders confidence that tree planting was a credible farm management activity and in their ability to succeed in species selection and establishment. 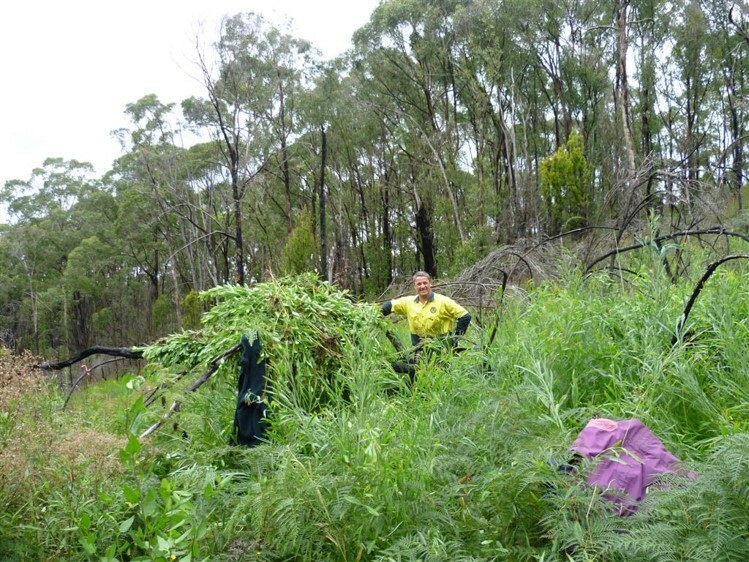 The Landcare group provided a lot of support in species selection, and, as the demand for shrubs grew, the nurseries responded by increasing their availability. Nearly all revegetation in West Hume has used local species, and as far as possible these were grown from locally sourced seed. The diversity of shrub species used increased over the years as knowledge and availability of the local flora improved. Roadside survey. Local knowledge was greatly increased following the roadside survey carried out by 38 landholder volunteers. They surveyed 460 km of road, recording floristics, conservation value and causes of degradation. A total of 111 native species were recorded, including 28 shrubs, but very few road sections had greater than 50% shrub cover. Many of the shrubs. 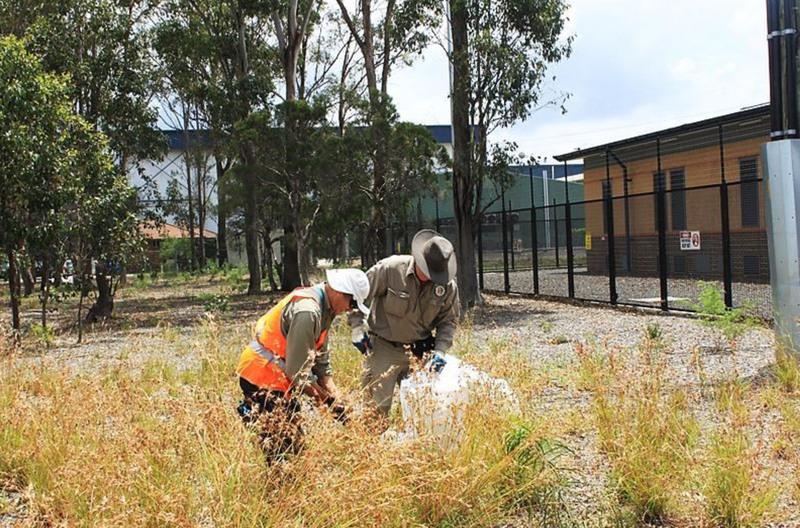 grasses and forbs recorded are considered rare in the landcare area. Knowledge of the whereabouts of these small remnants has allowed seed collection and propagation of some of them in seed production areas on local properties and at the Wirraminna Environmental Centre at Burrumbuttock. The need for this local source of seed has been emphasised by the observation that in the case of a few acacia species, local forms are different from those growing in neighbouring areas. Landcare survey. Landholder views about the importance of vegetation was shown in a landcare survey carried out in 1999. 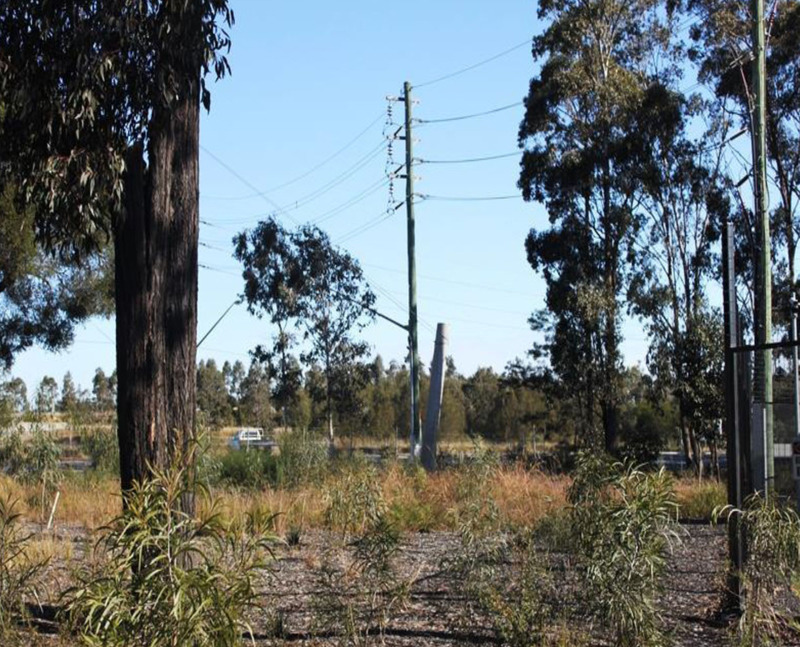 A majority of the 60% of respondents considered that dieback of trees and the lack of shrubs, understorey and wildflowers was of concern and there was a clear concern expressed about the decline of native birds in the area. When the “Taking Charge of Recharge” project was funded in 2001, the response of landholders was enthusiastic. The group members were eager to take advantage of the high level of incentives available in this project to increase the scale of planting beyond that generally undertaken previously. While the prime purpose of the funding was for recharge management, members were keen to establish local species in ecologically appropriate sites. Ecological and botanical skills within the group were able to support the species choices. This confidence in the value and feasibility of large revegetation projects has been continued in subsequent years when the Murray CMA has offered good incentives for large area plantings. Fig 1. School student volunteers planting in block AA on ‘Warrangee’ in 1995. Fig 2. Resulting tree and shrub habitats created from 1995 planting on block AA, 2013. Fig 3. ‘Corridors of green’ project, 2013, planted in 1994, “Warrangee” . Regeneration of Lismore bushland cemetery, north coast NSW. 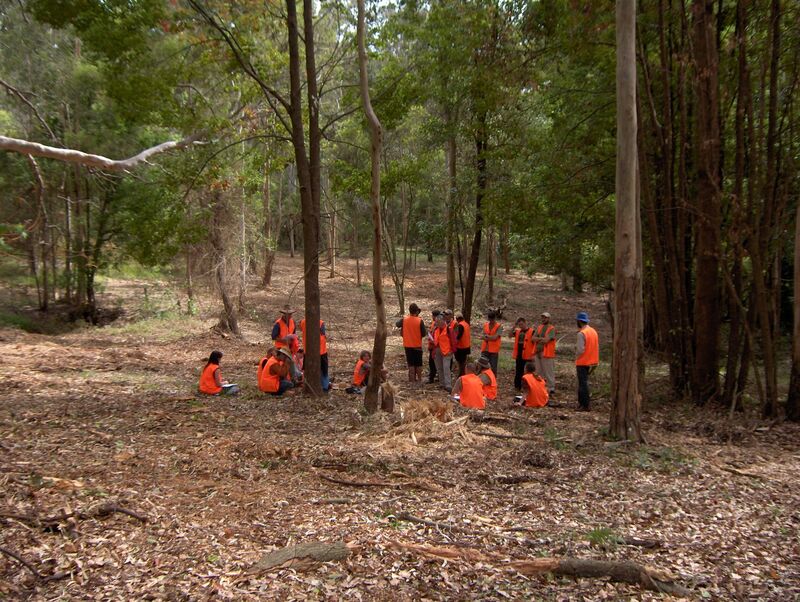 Posted on 25 November 2012 by emrprojects | Comments Off on Regeneration of Lismore bushland cemetery, north coast NSW. 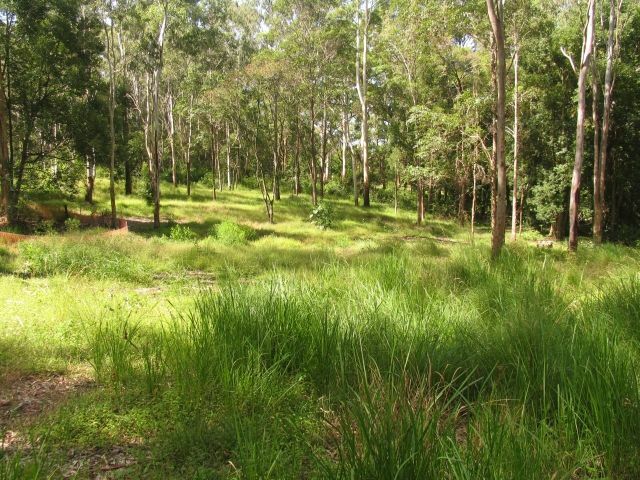 Since 2006, Lismore City Council’s Lismore Memorial Gardens (LMG) has been restoring and managing a 1.5ha patch of regrowth Forest Red Gum (Eucalyptus tereticornis) grassy open forest in Goonellabah, north coast NSW – primarily for use as a bushland cemetery. 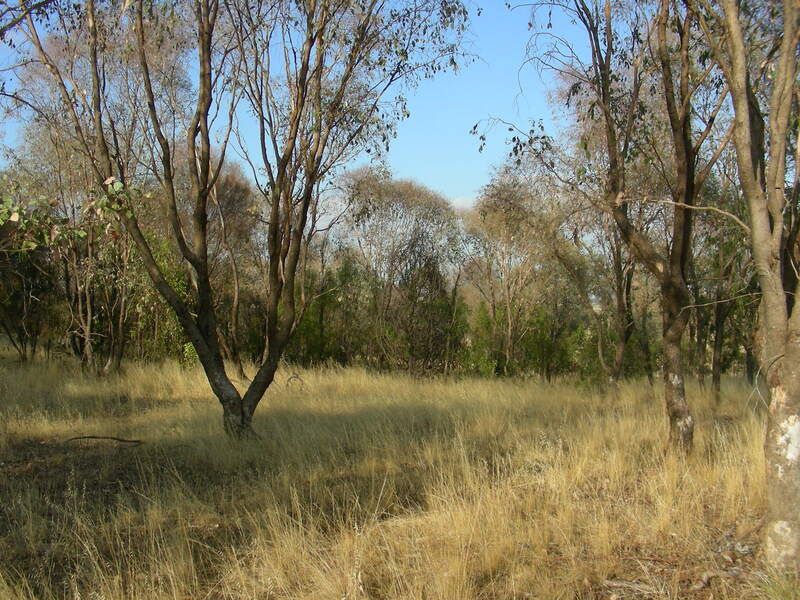 The site was part of a registered corridor for Koalas (Phascolarctos cinereus) and was in a highly weedy condition prior to the commencement of the project. The understorey was dominated by Lantana (Lantana camara), constricting Koala movement, and most eucalypts had at least one multi-stemmed Camphor Laurel (Cinnamomum camphora) encircling it. Bush regeneration works. In 2006 the lantana was mechanically cleared and Camphor Laurels were stem-injected with glyphosate herbicide. After woody weed removal, the ground stratum rapidly responded with a germination flush of herbaceous weeds, mainly Blue Billygoat Weed (Ageratum houstonianum), Farmers Friends (Bidens pilosa) and Broad-leaved Paspalum (Paspalum mandiocanum) although some native herbaceous species were also regenerating, particularly Basket Grass (Oplismenus aemulus), Weeping Grass (Microlaena stipoides) and Kidney Weed (Dichondra repens). Subsequent detailed spot spraying with herbicides was undertaken; in the first few years on a monthly basis by volunteers, and more recently by a horticulture-trained LMG staff member after some workplace tuition in bush regeneration methods. 1. Resilient areas. Herbaceous weed was systematically sprayed with broad-leaf selective herbicides (Dicamba/MCPA plus surfactant) or glyphosate. Three larger patches consolidated with native species fairly rapidly, while other areas in poorer condition colonised with fewer species or took longer to convert to native dominance. There are now 69 species on site that are characteristic of this ecosystem (including 8 tree species, 15 grasses, 5 sedges, 8 twiners/climbers, 5 ferns and 1 moss). About 20 of these species have been added to the list since the start of the project and all existing species have vastly increased in cover and density. The intermittent watercourse area regenerated over time with wetland herbaceous species largely including Persicaria spp. and Cyperus exaltatus. 2. Highly weedy edge. 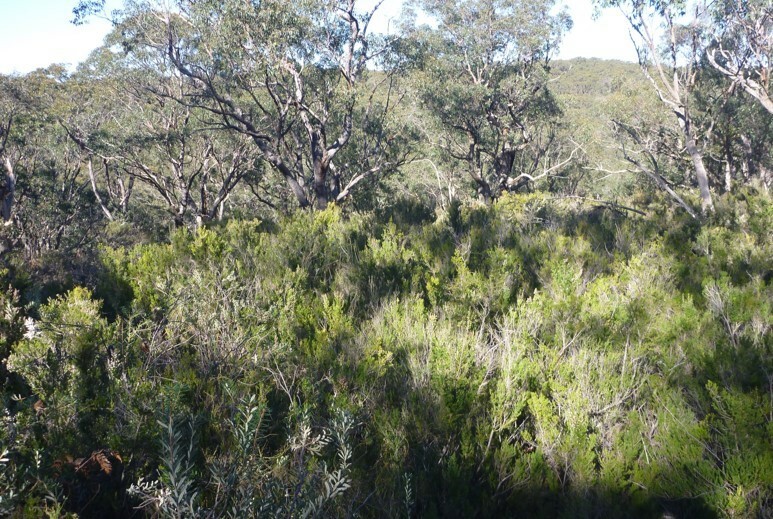 Standard bush regeneration approaches over at least 2 years in an edge site proved intractable due to high weed contamination and low native richness. 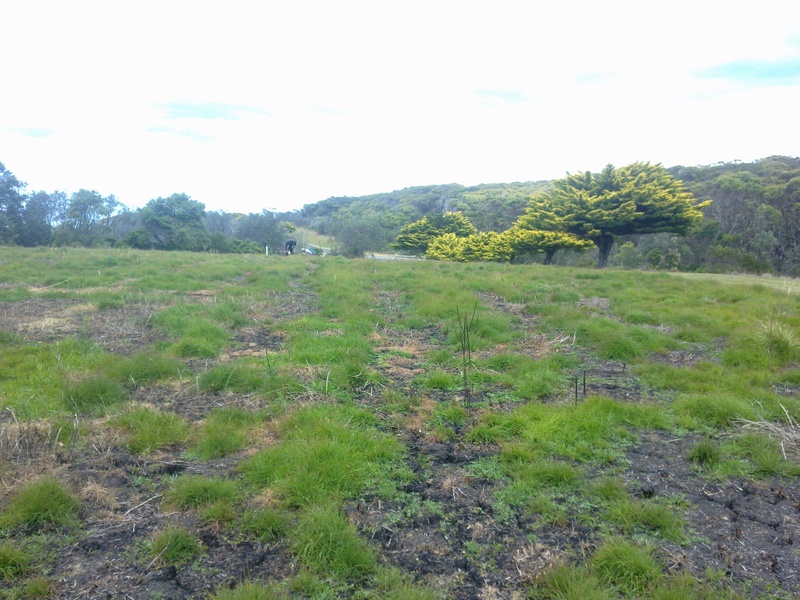 A trial was conducted in 2009to see if scalping and revegetation (using transplanting and direct seeding ) could reduce the amount of weed control required and improve native vegetation establishment. This involved removal by a grader of 10 cm of the weedy topsoil, with the remaining subsoil broken up with a backhoe and hand raked. Sods containing multiples of 10 species were taken from the healthier parts of the cemetery and transplanted to the raked site in mid- to late-September 2009, resulting in a total of 145 plants in each of three zones (one transplanted only, one transplanted plus direct seeded with 10 species and one neither transplanted nor seeded). Seven weeks later, when germination from the sods had occurred, it was observed that 17 species (i.e. seven more) had been transplanted (Table 1.) Very few individual transplants died. Subsequent monitoring found that all the two scalped and revegetated zones, while requiring monthly weed control initially, had consolidated to a very low weed state by 9 months. There was little visible difference between them except that the seeded one contained two more species not present in the unseeded site. Within 18 months, both zones had very high cover levels of native vegetation, particularly native grasses, and weed control demand was substantially lower than adjacent edge sites treated with conventional spot spray methods alone. The non-transplanted or seeded zone remained with low species diversity and was more exposed to weed cover. It has since become an access track and requires higher weed control inputs than the adajacent revegetated areas. Lessons learned. 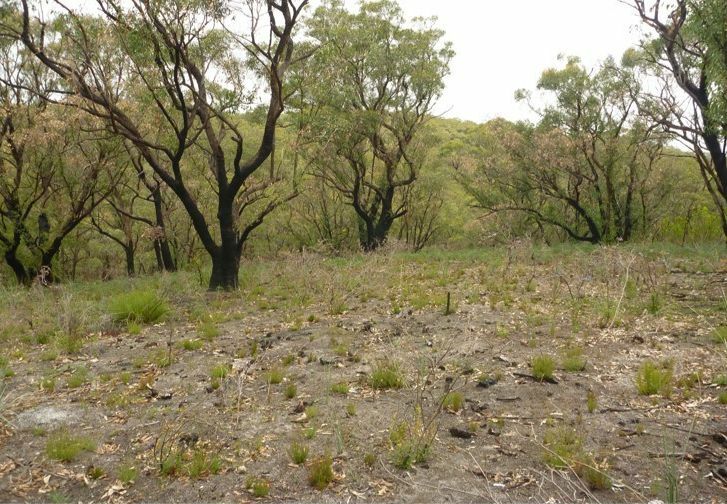 The bush regeneration treatments have converted a weed-dominated site to a recognisable Forest Red Gum grassy open forest with a diverse understorey. 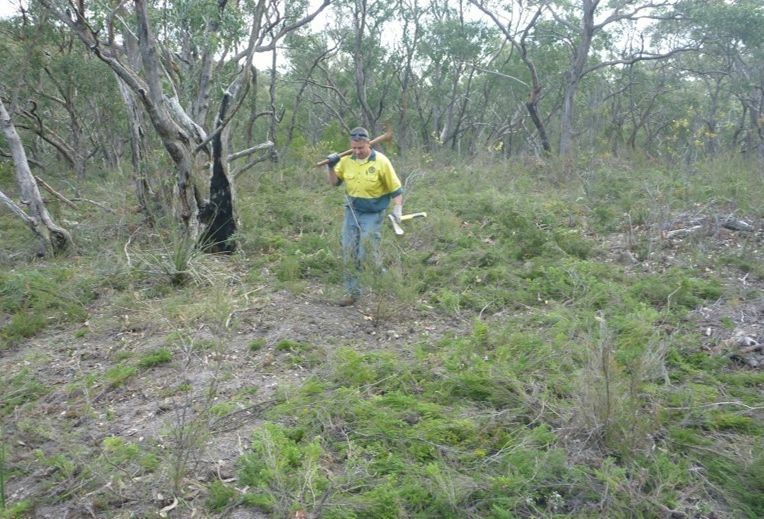 Cemetery operations are ongoing with the condition of the bushland showing an improvement with each year. Evidence of wildlife use of the habitat is increasing. This is due to ongoing management support, continuing volunteer inputs and the deployment of staff with some training in weed and bushland management. 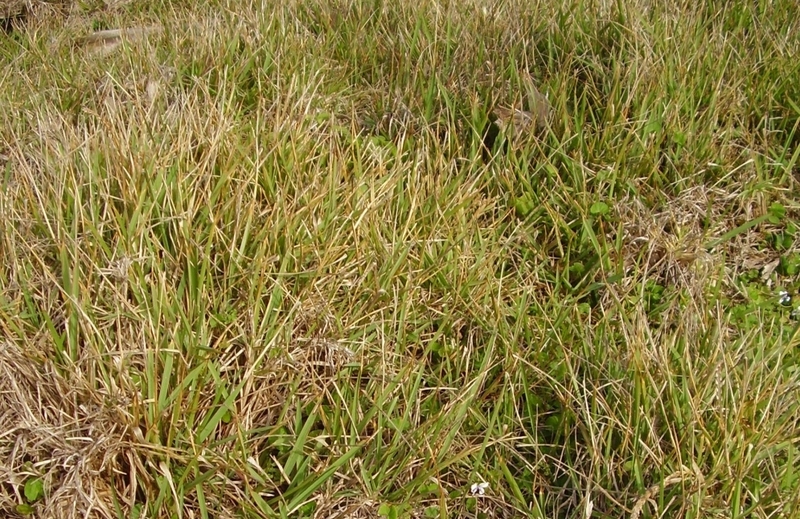 Although a range of highly problematic weeds (including Asian Copperburr, Acalypha australis, Prairie Grass, Bromus uniloides, and Hairy Commelina, (Commelina bengahlensis ) were initially not adequately addressed and are now requiring additional treatment; the site is a viable demonstration site for not only restoration techniques but also the district’s grassy understorey species, once so widespread but now rarely conserved . Comments Off on Regeneration of Lismore bushland cemetery, north coast NSW. Key Words: Minimal disturbance, bush regeneration, Eucalyptus fasciculosa, volunteer, Bush For Life. 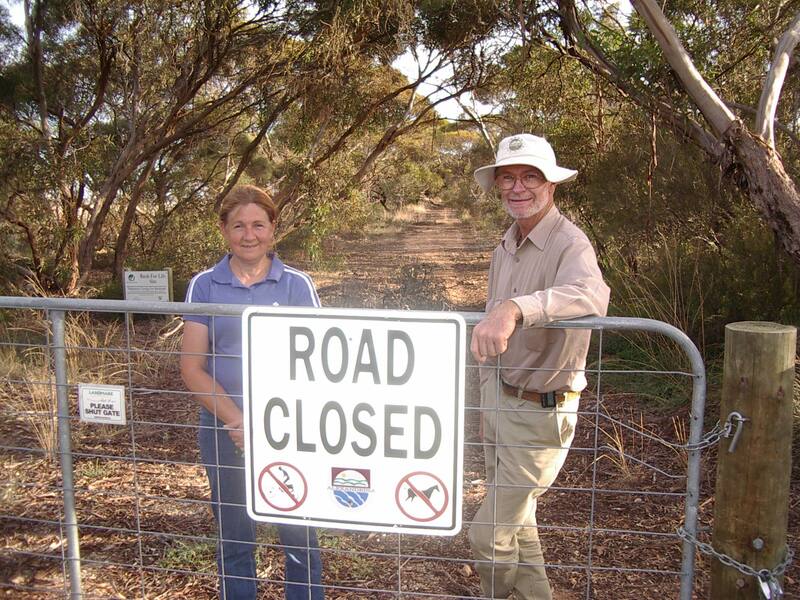 The Site: In June 1996 Trees For Life (TFL), a community based not-for-profit organisation, established a volunteer bush regeneration site (known as a Bush For Life site) on a 1.4km long, one chain wide roadside remnant on Research Road about 6km south of Strathalbyn, SA. At this stage the road was still being used as a vehicle track. The vegetation was a very diverse Pink Gum (Eucalyptus fasciculosa) Open woodland with occasional mallee eucalypts, a shrub understorey, sedge and herbaceous groundcover and native grasses with many locally rare and vulnerable species including the nationally vulnerable Silver Daisy-bush (Olearia pannosa ssp. pannosa ). The largest weed problem was Bridal Creeper (Asparagus asparagoides) which blanketed the site in the cooler, wetter months. 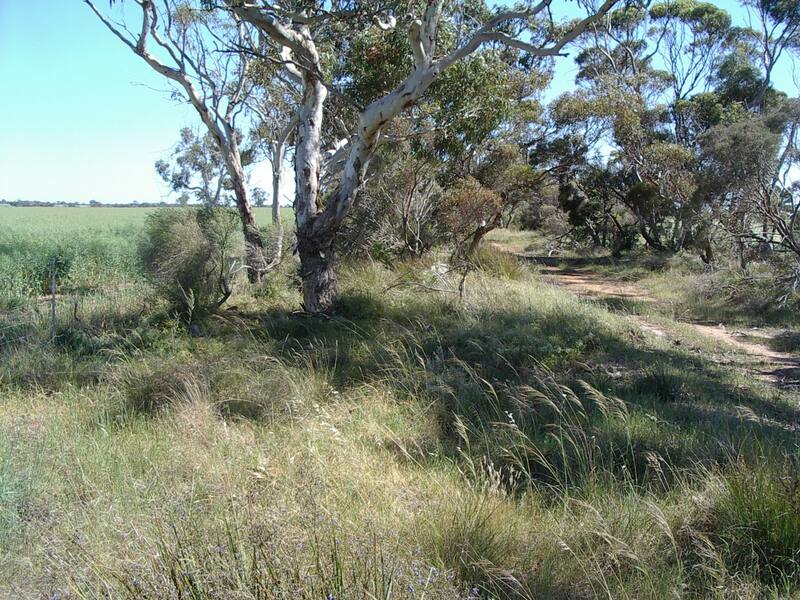 Other threats to the understorey diversity included broadleaf weeds typical of the dry, agricultural landscapes of the lower Murray Plains. These weeds included Pincushion(Scabiosa atropurpurea), Wild Sage (Salvia verbenaca) and Horehound (Marrubium vulgare ). 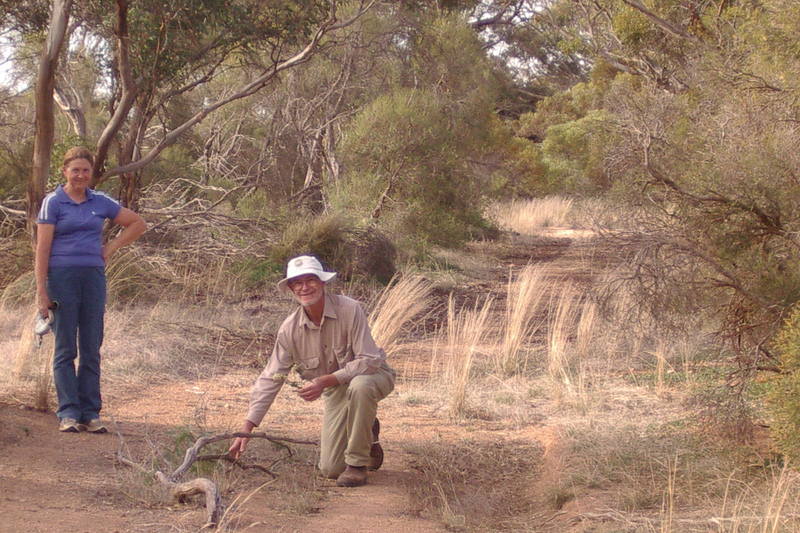 Works: Volunteers worked on a section of the 1,400m long, one chain wide road reserve, using minimal disturbance techniques. The regenerators very carefully removed Bridal Creeper, broad leaf weeds and weed grasses; but they had to contend with the continual degradation of the remaining area. It was really only a heavily rutted, two-wheel track suitable for dry weather use only, but was subjected to indiscriminate and illegal use through all seasons, including rubbish dumping, firewood collection and “bush-bashing”. 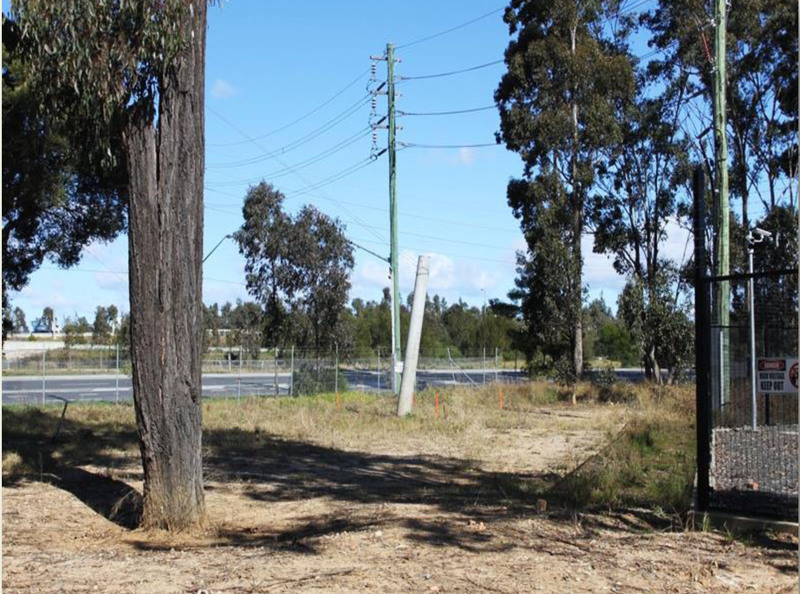 The Alexandrina Council closed the road to motor vehicles in September 2008 and it has been allowed to recover now for 4 years. After the road closure, discussions between Council and TFL centred on whether to leave the vehicle track to regenerate by itself or to “rip” the track to fill in the ruts and promote germination. As ripping the track was predicted to have have promoted prolific broadleaf and grassy weed establishment, particularly given the close proximity of weedy agricultural land adjacent to the linear reserve, the BFL principle of minimal disturbance prevailed and the track was left to regenerate without other intervention. Results: Today there is a proliferation of native species germinating on the track, with native regeneration on the track itself far outweighing the weed regeneration. The ruts have filled with leaf litter and have encouraged the germination of spear grasses Austrostipa sp.) and wallaby grasses(Austrodanthonia sp.). As the volunteers discover new seedlings they protected them with branches; but regeneration has become so significant that this is no longer practical. . Many Mallee Honey-myrtle (Melaleuca acuminata) and Dryland Tea-tree (Melaleuca lanceolata) seedlings have germinated and are thriving in bare patches. Many other species are also germinating, including: Golden Wattle (Acacia pycnantha), Hakea Wattle (Acacia hakeoides,) Sweet Bursaria (Bursaria spinosa), eucalypts (Eucalyptus spp. ), Ruby Saltbush (Enchylaena tomentosa), Climbing Saltbush ( Einadia nutans ssp. nutans), Old Man’s Beard (Clematis microphylla var. microphylla), Australian Bindweed (Convolvulus sp., and New Holland Daisy (Vittadinia sp.). Black-anther Flax-lily (Dianella revoluta, Mallee Blue-flower (Halgania cyanea,), Rosemary Dampiera (Dampiera rosmarinifolia ) and Quandong ( Santalum acuminatum) are spreading from the sides onto the track. 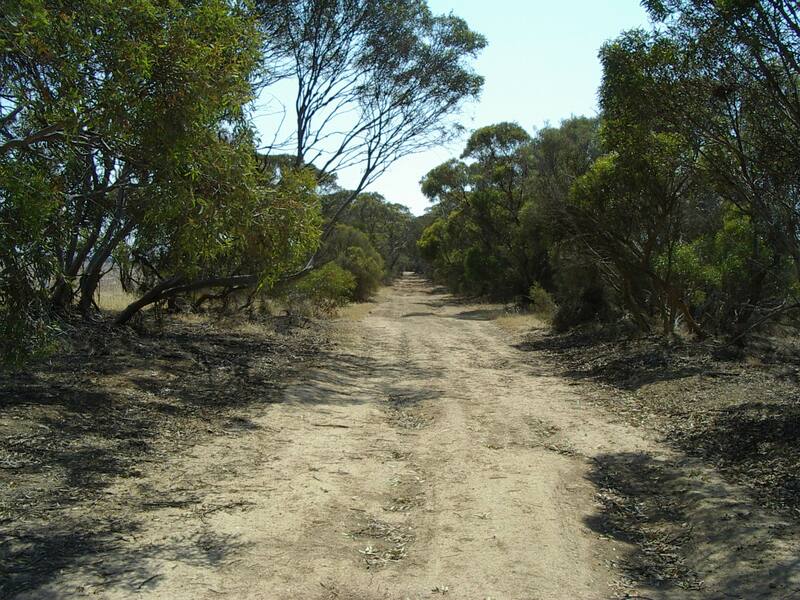 Areas where once a vehicle could drive have now been reduced to a narrow walking track between seedlings. Treatment with Bridal Creeper rust (Puccinia myrsiphylli) began in 2004/2005 with wider and more intense applications applied every year from 2008. In the last couple of years rust has established itself over a large proportion of the site with very little flowering and fruiting detected during 2011. Volunteers carefully treat plants at both ends of the site by ‘tonging’ with glyphosate (i.e. using tongs with sponge tips as herbicide applicators) which has been very successful. Through careful and consistent work, most of the broad-leaved weeds have been virtually removed from site, with only isolated germinations being detected and removed. One other weed – : Soursob (Oxalis pes-caprae – is prolific on site; and has yet to be targeted for control. Rabbits re-entered the site early in 2006 and by mid-2008 had bred up to occupy 15 locations on site. 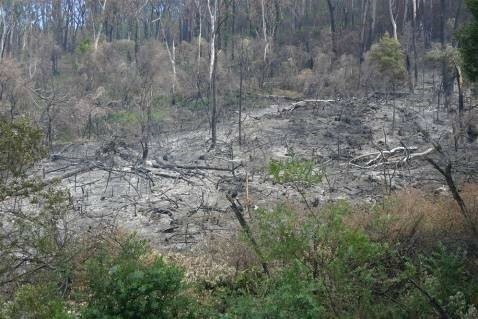 They caused significant damage to the native vegetation until controlled by baiting in March 2010. The increase in native grasses in the areas treated has been significant. Lessons learned: Four significant events have had the greatest effect on this turnaround: the road closure, the control of rabbits, the establishment of Bridal Creeper rust and most significantly the consistent hard work of the site’s Bush For Life volunteers. Acknowledgements: This site is owned by the Alexandrina Council and is managed in partnership with Trees For Life who train and support volunteers through its Bush For Life program. Fingal Head, whose first inhabitants are members of the Cudginburra Clan, is a famous beauty spot in the far north coast of NSW, heavily utilised for recreation such as fishing, surfing, whale and dolphin watching and family outings. It is estimated that upwards of 50,000 visitors per annum use the site. As a result of this and other impacts including unfettered goat grazing (commencing around the lighthouse in the late 19th century), the site has many management challenges, including extensive gully and rill erosion, trampling of native vegetation, wildflower harvesting and weed invasion. 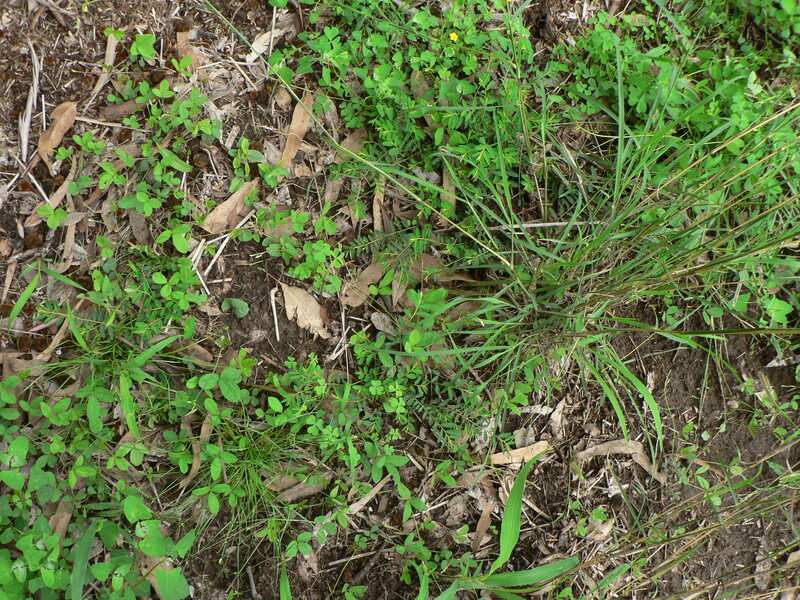 Prior to treatment, the ground cover layer was almost completely dominated by a form of the exotic Buffalo Grass (Stenotaphrum secundatum) and a suite of other weeds including Bitou Bush (Chrysanthemoides monilifera ssp rotundata). Because similar headlands in the region (Norries Head and Hastings Point Headland) support the State-listed Endangered Ecological Community Themeda Grasslands on Sea-cliffs and Headlands it is assumed that Kangaroo Grass (Themeda triandra) was native to the site and became locally extinct due to the history of grazing and weed invasion. 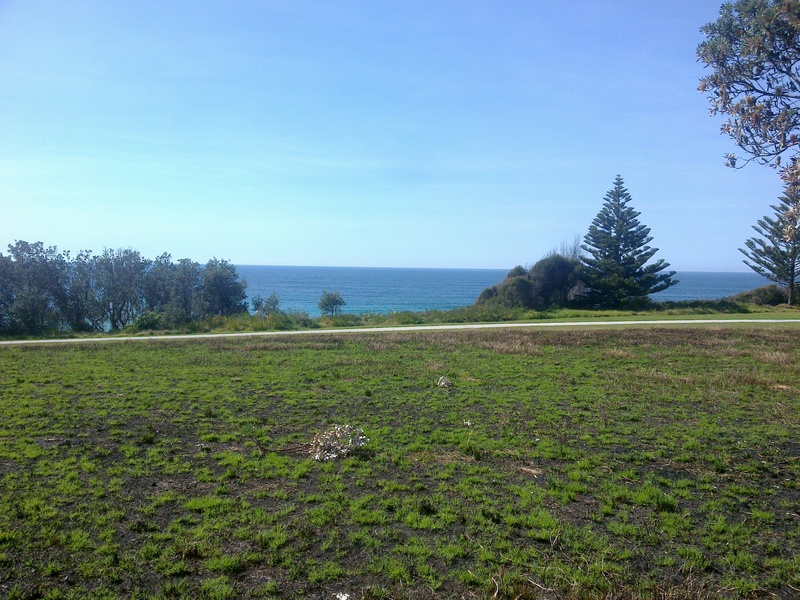 Project works: In 2009 Fingal Head Coastcare determined that work to address the serious weed problems should commence and that trials be undertaken to reintroduce Kangaroo Grass. Several small plots (100m² ea.) were sprayed with herbicide and slashed (Fig 1). Regenerating weed was regularly removed. 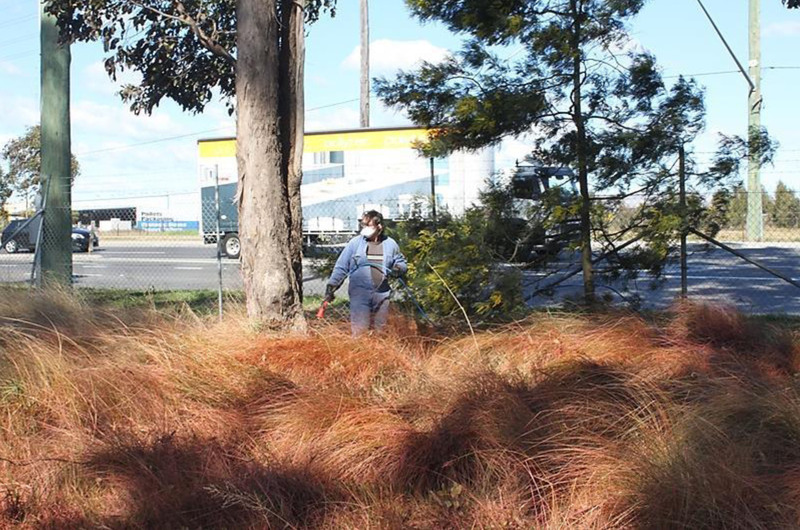 The plots were sown with Kangaroo Grass seed collected from other headlands in the region. 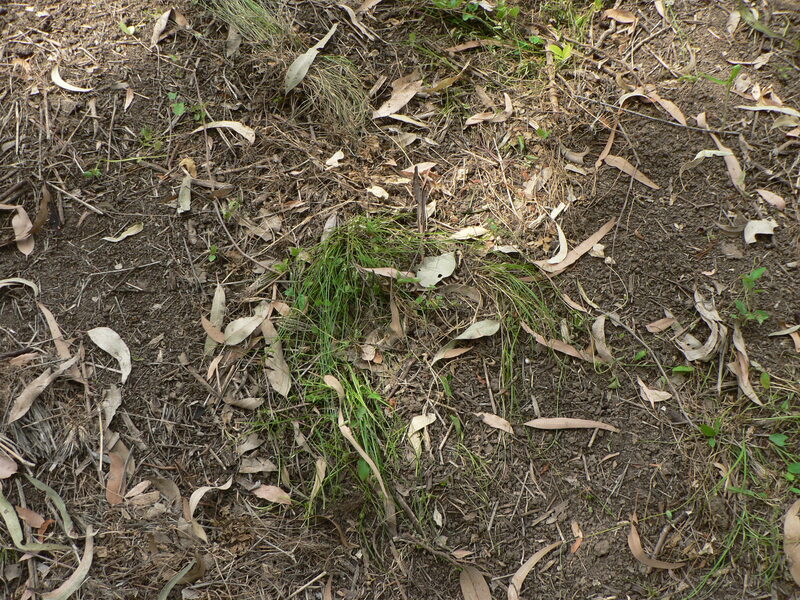 The material used is a genetically distinct coastal form of Kangaroo Grass that exhibits a unique decumbent growth habit. Ripe fruiting culms were distributed in quadrats as well as randomly over the plots. 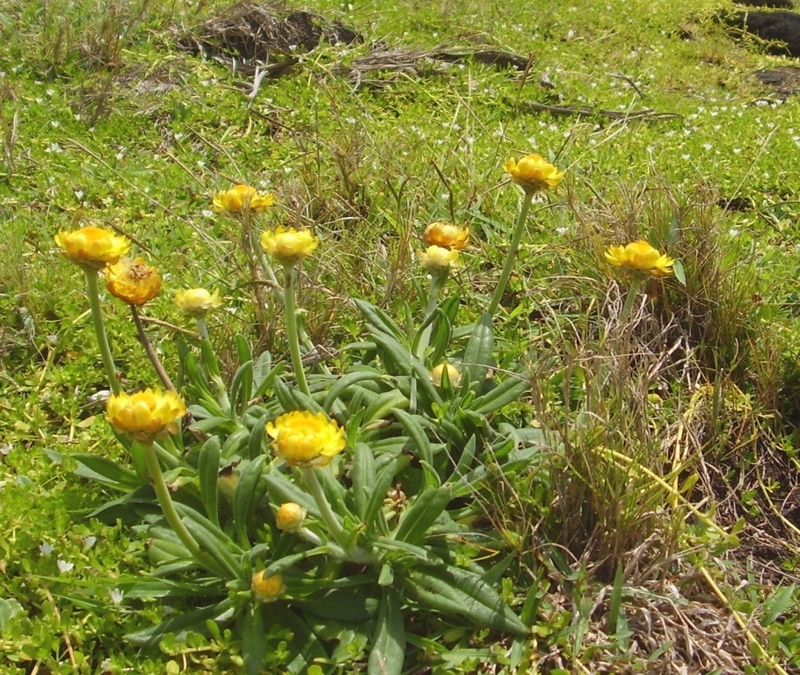 In addition to the Kangaroo Grass trials, efforts were made to plant a variety of typical Grass and Forbland species, including Golden Everlasting Daisy (Xerochrysum bracteatum), Evolvulus alsinoides and Chamaechrista maritima. These were propagated in the Fingal Coastcare nursery from seed and stock sourced at nearby headlands. Results. Regeneration of native species was extensive across the plots (Figures 2a and 2b). Regenerating native species included Prickly Couch (Zoyzia macrantha), Native Violet (Viola banksii), Angled Lobelia (Lobelia alata) Plectranthus (Plectranthus cremnus) and Beach Bean (Canavalea rosea). Fig 2a: Typical Buffalo Grass infestation prior to commencement of trials. 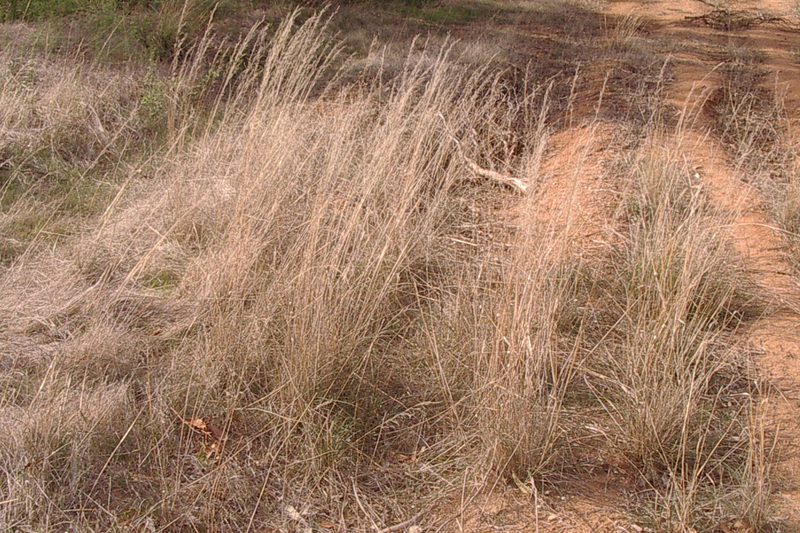 Fig 2b: Example of regeneration of native grasses Prickly Couch and Blady Grass after works (Plot 1, 2011). Fig 3: Everlasting Daisy re-established and recruiting on Fingal Headland. Outcomes and lessons learned The low rate of Kangaroo Grass germination is not regarded as a major impediment to the overall success of the project. 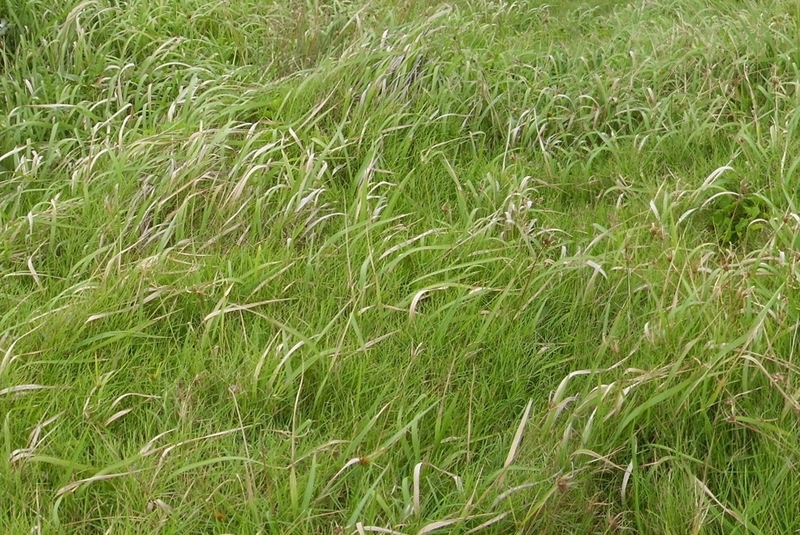 As natural processes and cycles come into play, it is probable that Kangaroo Grass will become a significant part of the biota on the headland. 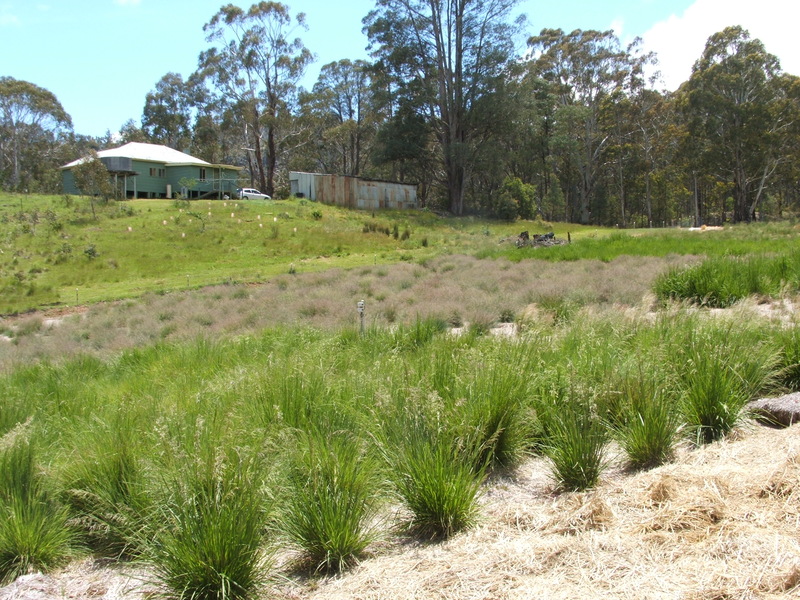 That is, achieving the ultimate aim of a Closed Tussock Themeda Grassland is probably unlikely through reintroduction from the seed sowing methods we used, but may occur naturally over time. The extensive natural regeneration of the threatened Plectranthus cremnus is a major success of the trials. This herb species is habitat for a local population of Blue-tongue Lizards and Bearded Dragons. It is a major food source for the reptiles, supplementing their animal diet, which may be very seasonal. Erosion control has been significantly reduced through active intervention, using hard infrastructure in combination with ‘low key’, passive techniques such as strategic plantings and bush debris. Local school children are involved in the plantings on an ongoing basis, and have picked up vital local knowledge and site ownership along the way. This project has been a major education experience for the Coastcare group, the Tweed Byron local Aboriginal Land Council and many members of the Fingal Head Community who were previously not aware of this Endangered Ecological Community . The trial areas are now a profusion of wildflowers almost the year round and the Coastcare volunteers receive many compliments from the passing public. During working bees on the site considerable energy is devoted to educating the public about the Grasslands in the hope that this will assist in their protection (and also because it is a lot of fun!) Anyone who visits the site will be captivated by the delicate beauty of the native flora, the awesome scale of the natural scenery and will surely agree that something special is happening here. Where to from here? : One of the most challenging and pressing issues facing the headland is uncontrolled pedestrian traffic. Although this may be unavoidable to some extent, it is desirable for the long term health of the ecosystem that some control methods be introduced to the site. Trials have been conducted using bush debris with limited success. More permanent methods would have to be carefully designed and implemented in order to blend with the unique aesthetics of the site. Boardwalk construction has been very successful in key areas, however this type of construction is deemed inappropriate for the grassland proper. Dense vegetative barriers consisting of tussock forming species such as Spiny Mat Rush (Lomandra longifolia) and Knobbly Club Rush (Isolepis nodosa) are being planted to rationalise the trackways and guide pedestrians away from more sensitive areas. In terms of the vegetation restoration works, ongoing and extensive follow-up weed control is required and it is envisaged that as each plot is stabilised and achieves manageable levels of autonomy, new areas will be opened up for weed control. It is recommended that a formal Restoration Plan be developed and implemented, perhaps through funding avenues or the involvement of Environmental Science students. This would greatly assist guiding the works over an extended period and help achieve the best possible outcomes for Fingal Headland and the wider community. Partners and Investors: Fingal Head Coastcare Inc. consulted with the Tweed Shire Council, The Tweed Byron Local Aboriginal Land Council and a number of community groups to plan this project. The community groups include the Fingal Heads Community Association, the Fingal Head Public School, Fingal Rovers SLSC, local businesses and other Tweed Coast Dune care groups. Key words: grassy understorey, assisted natural regeneration, Bushcare, Green Panic. Wolston Creek Bushland Reserve, is a 47 ha Brisbane City Council (BCC) Bushcare Site at Riverhills, in the south-west outskirts of Brisbane, Queensland. 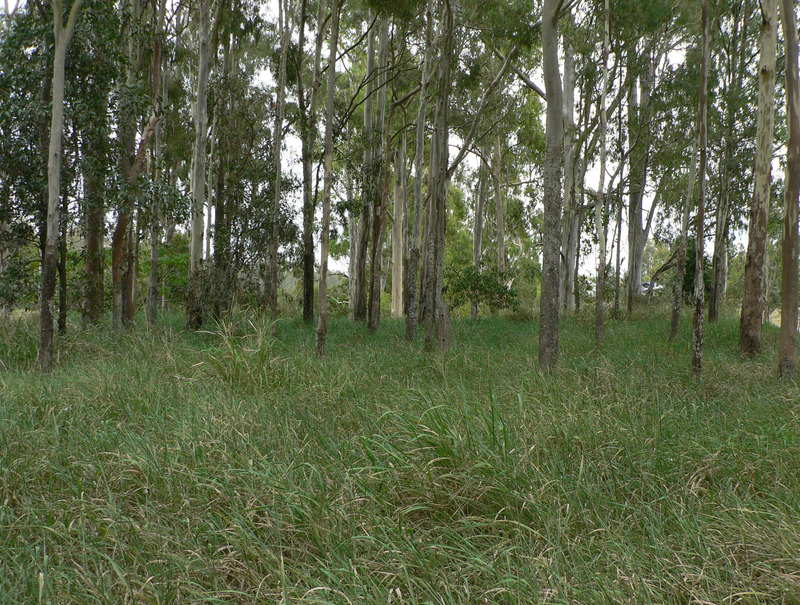 Although only a relatively small area of bushland remains, connectivity is provided by Wolston Creek, its tributaries Sandy and Bullockhead Creeks and the banks of the Brisbane River. This report is about just one of the plant communities that the Bushcare group (a handful of dedicated locals) is working on: a 1.55 hectare patch of Forest Red Gum (Eucalyptus tereticornis) forest with a grassy understorey (Fig 1). 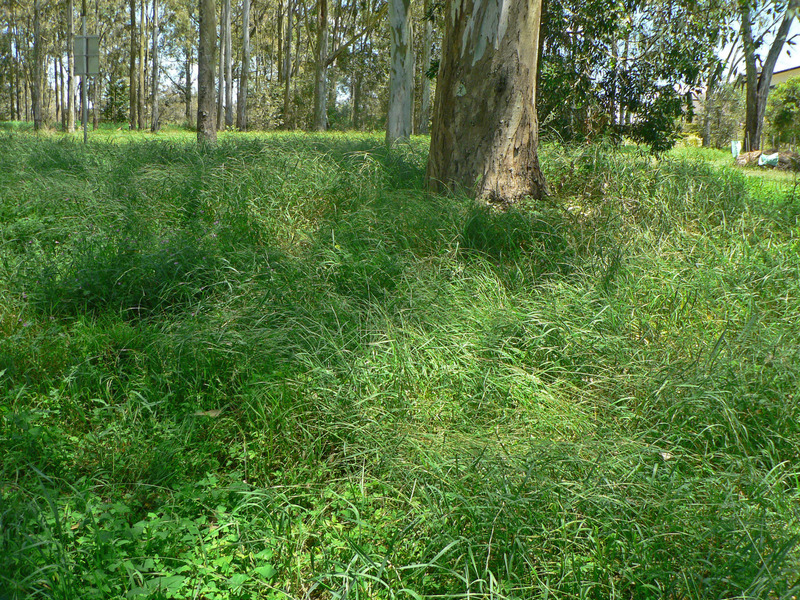 In mid-2008 when the project commenced, the understorey of the forest was virtually entirely dominated by the exotic grass Green Panic (Megathyrsus maximus var. pubiglumis) due to past clearing and the sowing of pasture grasses for grazing. However, as there were some native grasses still evident, we wondered whether the site might respond to an assisted natural regeneration approach that has worked on other sites. Out of curiosity, we cleared Green Panic by hand around a patch of native grasses to give them space to expand. In the process we found that, under the cover of the Green Panic, were struggling native grasses, sedges and wisps of herbs (Fig 2). This then became a test patch, which in turn became a stand of Pitted Bluegrass (Bothriochloa decipiens). The outstanding results energised us to continue. Fig 2 (a) Much of the site started with very small native germinants which would have been inadvertently killed had the site been sprayed with herbicide. Photo (a) shows how few natives were sometimes initially revealed – in this case Whisker Sedge (Cyperus gracilis), Common Bindweed (Polymeria calycina) and native Glycine sp. Our treatments. We further cleared the Green Panic using mattocks. With the weed cover much reduced, rains brought a massive annual weed response. We considered spot spraying but while the seedbank response was still being discovered, every native plant was important, so the enthusiasm was there to increase hand weeding on an extended basis. To cope with the volume of hand weeding required, removal was aimed mainly at weed individuals that were flowering and/or seeding. The result was a gradual reduction of weeds and maintenance of a microclimate for germinating natives. As this site matured and produced such a vigorous response from natives, it became possible to consider other techniques. In January 2009, an adjacent area was slashed by BCC to prevent Green Panic from seeding into the work area. By May, with good rains, the slashed area had produced a resurgence of natives, so BCC was asked to stop slashing. We mattocked out the Green Panic crowns, increasing the original work area by 50%. We realised that slashing several times proved to be a good preparation for primary weeding. With the Green Panic tops cut and largely decomposed, the pattern of natives and weeds was better revealed and allowed light to trigger germination and growth. Subsequently, it was found that initial ‘overspraying’ (taking care to spray the standing Green Panic only) produced a similar response. Results. Compared with the former near-monoculture of Green Panic, the ground stratum now has abundant native cover comprising: 18 species of native grasses; two sedges; 19 forbs; one shrub; five twiners, and both Forest Red Gum and Maiden’s Wattle (Acacia maidenii) are regenerating. 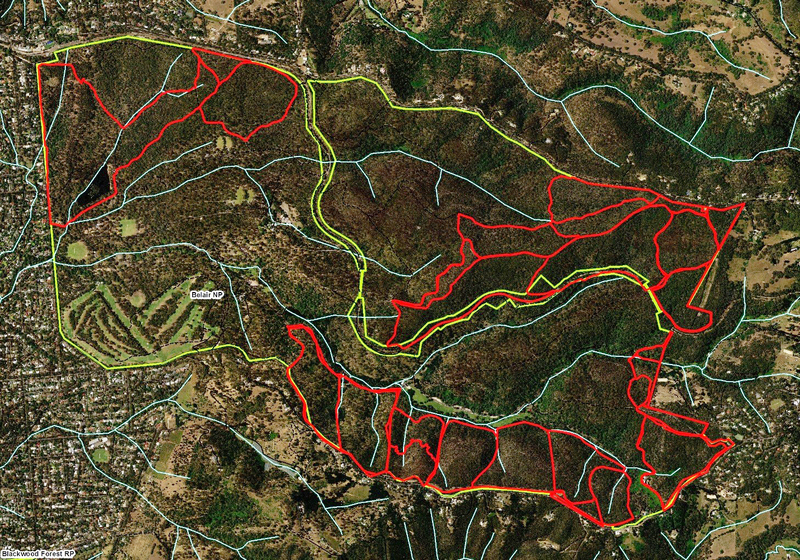 The area treated within the first year (250 m2) has now been expanded to 1.55 ha. Of this, 30% can be considered on ‘maintenance’ i.e. stable native cover, requiring minimal visits for the occasional weeds. A further 65% is undergoing secondary treatment (still requiring regular work to bring it to ‘maintenance’ stage) and about 5% has undergone primary treatment in 2012. 2. Where appropriate, consider slashing/brushcutting/or spraying weedy grasses as preparation for (or initial phase of) primary weeding in areas that have been found to have strong resilience. 3. Try to view the post-primary weed flush (which often appears to be a ‘sea’ of annual weeds) as part of the recovery process rather than become overwhelmed by it. The gradual removal of weed still provides protection for germinating natives. 5. Plant identification is all important. At the start of the project, the main plant we needed to know was Green Panic. In the continual task of sorting weeds from natives, we remind ourselves that ‘If in doubt, don’t pull it out’. When a plant is found that we don’t know, it is time to take the interesting journey to the Queensland Herbarium. The people: curious; persistent; patient; willing to learn from our mistakes; learning to work with nature’s cycles. The site: has a strong seedbank that was triggered when rains came and its widely spaced trees made it suitable for preparatory slashing. The motivation: the reward and excitement of seeing a native plant community build in integrity and diversity. We anticipate that there is .5 ha yet to treat. Long term success therefore depends upon the continuation of the above factors and continued support from Brisbane City Council.